Yesterday's farm share consisted of 2 heads of lettuce, a bunch of kale, a head of napa cabbage, onions, little red turnips, 3 pounds of squash, 3 pounds of cucumbers, 2 quarts of fava beans, and 1 quart each of snow and snap peas, plus some flowers and herbs. We didn't pick the herbs this time. The kids and I brought it all home and I sent them outside to shell the fava beans and the snap peas, which were too big to eat whole. Once I got everything cleaned, I took a few steps to work through all the veggies that were accumulating in the fridge. I still had 2 heads of bok choi leftover, plus snow peas, scallions and some lettuce. 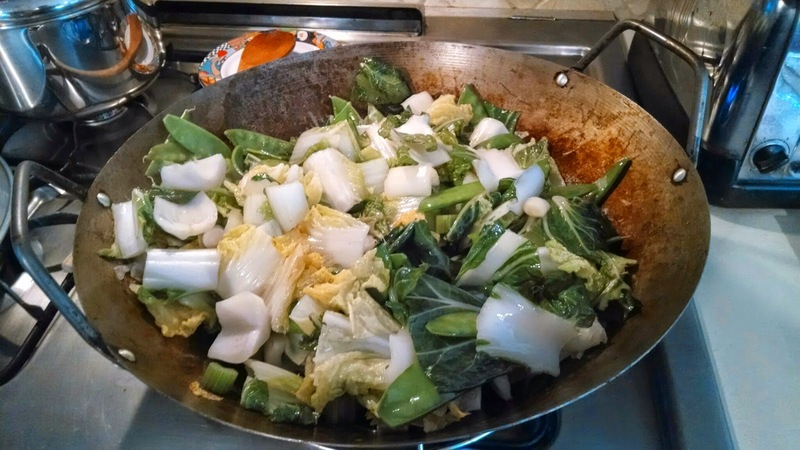 I started chopping away, and suddenly I had a huge bowl of stir fry ingredients: cabbage, bok choy (all of it), snow peas, celery, scallions, and onions. I made some rice and marinated some beef for the grill, and for dinner I fried all those veggies in the wok. It cooked down a lot, thankfully, because the pile of veggies was initially bigger than the wok. I drizzled them with soy sauce, rice vinegar, and sesame oil at the end, and we ate a fair amount of it over the rice. Plus we had a salad with some of the lettuce, Hakurei turnips, radishes, the blanched snap peas, a few mulberries, and some homemade croutons. 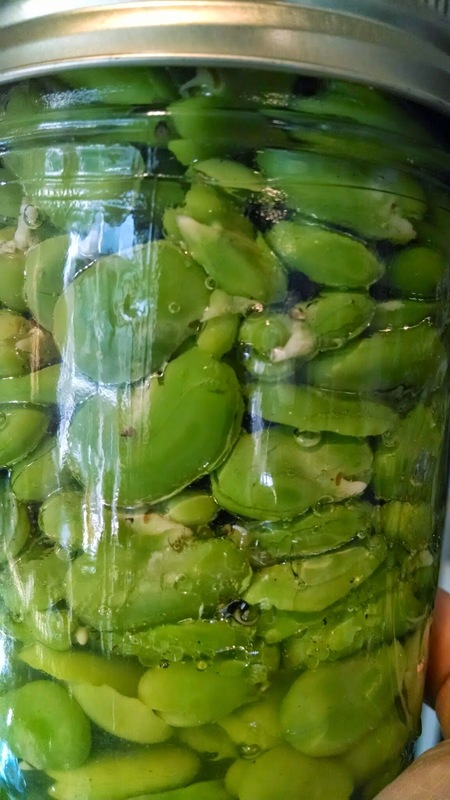 The fava beans got marinated again; 2 quarts of pods makes about 1 pint of beans and these will last for a while now. This morning I pickled the cucumbers. I specifically picked the smallest ones I could find so that we would have whole dills rather than slices. I used a recipe from the Complete Book of Small Batch Preserving, "Favorite Dill Pickles." This made 3 quarts of pickles, but there are really only 4 cukes in each jar. What's left? Lots of lettuce, turnips, radishes, garlic scapes, kale, 3 pounds of patty pan squashes, snow peas, and some swiss chard and another zucchini my mason gave me.